Bordering Kenya, Tanzania offers a wide diversity of wildlife, culture immersion and a land of continual contrasts. East Africa’s biggest country by a long way, home to the famous Serengeti, Ngorongoro Crater, Africa’s highest mountain and Africa’s largest lake it really does have it all. 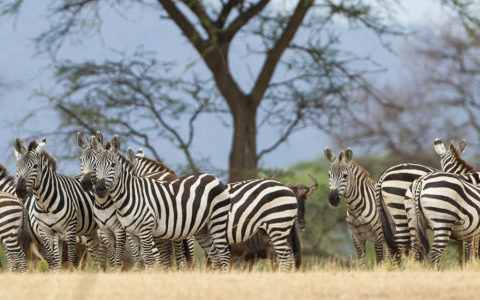 The Serengeti National Park, meaning “endless plains” in the Maasai language, is Tanzania’s oldest game reserve and undoubtedly one of the world’s most famous wilderness areas. It is most celebrated as the site of Africa’s greatest spectacle, the annual Great Migration. Located slightly off the main safari route, Tarangire National Park is a lovely, quiet gem of a park in Northern Tanzania. Tarangire meaning ‘river of warthogs’ is most famous for its elephants, birding and plentitude of baobab trees. Its authentic, untouched Africa at its best. Zanzibar is an exquisite archipelago of tropical Indian Ocean islands that lies about 35km from the coastline of Tanzania. Zanzibar is an island holiday like no other. It’s rich in culture, intrigue, beauty, history and of course spices too! From the volcanically rich soil to the lush forests, interminable golden savannahs, pearly white sands, snow capped peaks, baobab clusters, lush swamps, fields of sunflowers and a constantly overwhelming sense of space, there is so much to explore. Tanzania has three safari circuits and each one of them would make Tanzania a top wildlife destination. 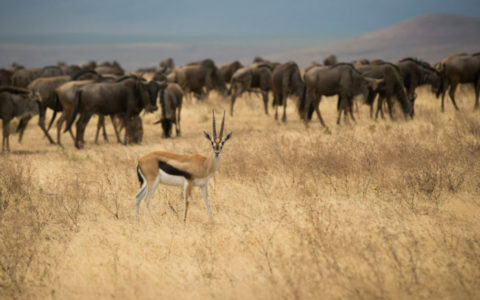 The popular Northern circuit with the Serengeti and Ngorongoro crater offers one of the best classical safaris in Africa, especially if timed with the annual wildebeest migration. Sit surrounded by 1.5 million wildebeest as you experience one of natures great wonders, sip a G and T on the shores of the flamingo-infested lake Manyara as the fiery sun sinks below the horizon, or survey the vast Ngorongoro crater from a breathtaking vantage point on the rim. 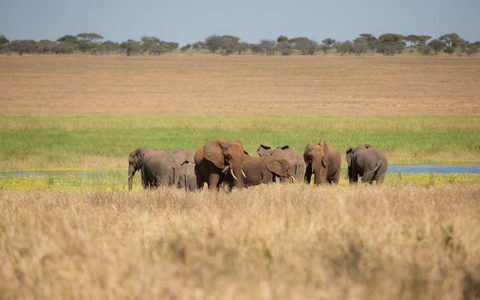 Tanzania boasts the highest game density in all of Africa and as a result the game viewing is simply spectacular. At any one time you will be in awe of the amount of game that you see whether its elephants, zebra, wildebeest, buffalo or giraffe… there will no doubt be more than one of them. The Serengeti is particularly famous not only for its endless plains but also for its healthy population of lion. Scattered in amongst the world’s finest game reserves, coffee plantations, maize fields, colourful Maasai villages and dynamic topography are our favourite luxury destinations. Only the very best in safari indulgence. As the Tanzanians say, ‘Twende porini,’ let’s go to the bush! There are three major international airports – Dar es Salaam, Kilimanjaro (near Arusha) and Zanzibar Island. Arusha town is the starting point for Tanzania’s most popular Northern Safari Circuit and Kilimanjaro International Airport is situated 46km east of Arusha. Tanzania’s main airport is Julius Nyerere International Airport located 13km southwest of Dar es Salaam. The latter is the entry-point for visitors to the southern parks. Moving on from Arusha or Dar es Salaam you can fly or drive between reserves or you can opt to do a bit of both. Iconic Africa have the most exclusive range of hand-picked Tanzania lodges which are guaranteed to surpass your wildest expectations! Simply contact one of our African travel experts and begin your journey to Africa with us now! Arguably one of the most luxurious hotels on the island, Essque Zalu Zanzibar has been awarded numerous high quality travel industry awards. The hotel is the winner of the Tripadvisor ‘Travelers Choice 2016’ Award and it has been nominated for the 2016 World Luxury Hotel Awards. Enjoy your own personal piece of paradise and create unforgettable memories at Essque Zalu Zanzibar. Experience the wonders of Zanzibar whilst spoiling yourself to the ultimate luxury beach getaway. Baraza Resort is an exclusive boutique hotel located along Bwejuu Beach – one of the top 30 island beaches in the world! Just off Zanzibar’s north-eastern tip, resting on a secluded island, you will find Mnemba Island Lodge – Africa’s most exclusive beach lodge. Famous for its astounding coral reefs and its esteemed reputation for being one of the most amorous ocean destinations in the world, Mnemba Island Lodge is the perfect romantic getaway. 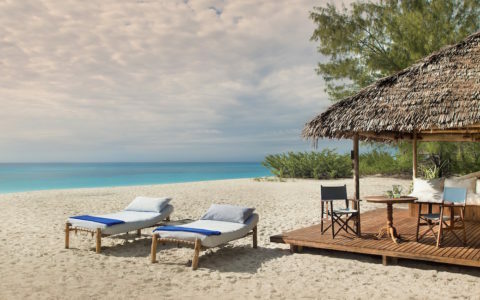 With its rustic charm and its gorgeous ocean views, Mnemba will not disappoint!